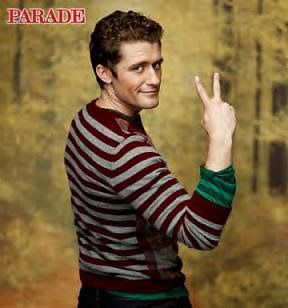 Stonewall Gazette: Glee's Matthew Morrison: "I want to be the next Gene Kelly"
Glee's Matthew Morrison: "I want to be the next Gene Kelly"
Robert Masello from Parade magazine has an interview with the star of Glee, Matthew Morrison. The talented actor had a lot of success on Broadway, receiving a Tony Award nomination for best actor in a musical in The Light In The Piazza. Morrison confesses, "... more people saw the pilot of Glee than saw me in my entire 10-year career on Broadway." Ah, the stage actor's lament. Below is an excerpt from the interview.